Think Goldwork embroidery isn’t for you? 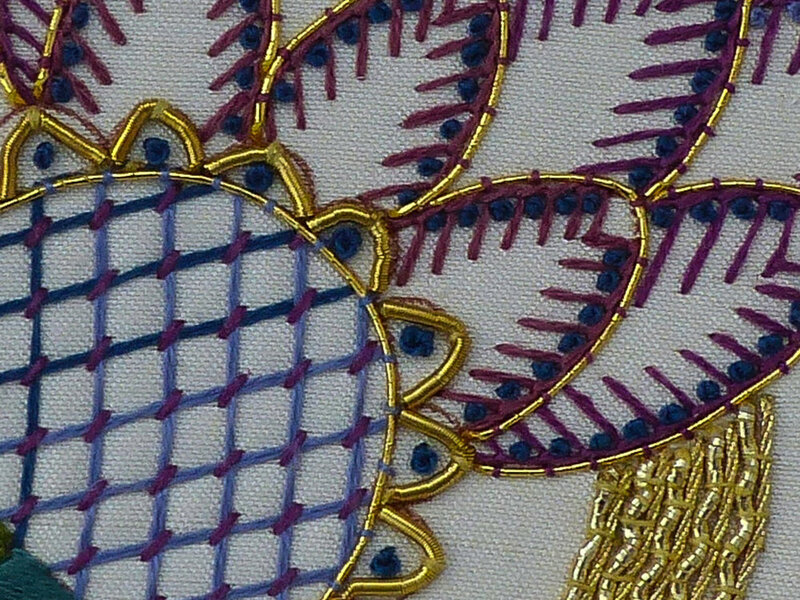 Goldwork embroidery has a long and ancient history. In England, there are records dating from the 10th Century and ‘Opus Anglicanum’ or ‘English Work’ was famous and sought after throughout the world from the 12th Century and beyond. The expense and nature of the materials made it perfect for displaying an institution’s wealth and power. With Royal and Ecclesiastical robes historically the main use of goldwork, you can imagine to the everyday subject these garments would have been an incredible sight. The embroidery would sparkle and glow in the candle or lamplight meaning the wearer would become almost otherworldly. This spectacle means that goldwork embroidery has never gone out of fashion. From Elizabeth I and her ‘great wardrobe’ filled with goldwork, through to Alexander McQueen and Dolce & Gabanna. 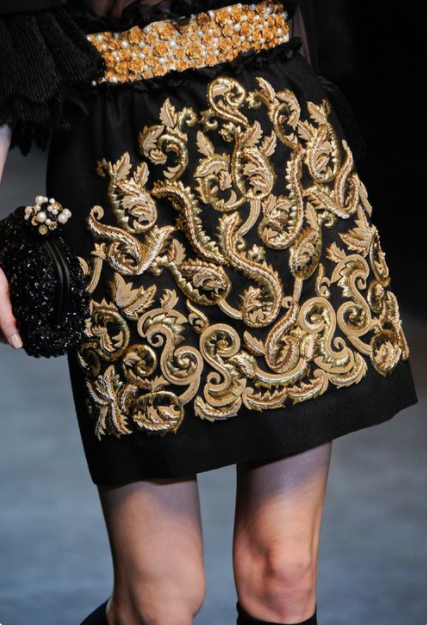 Sumptuous goldwork embroidered garments still reign supreme on the catwalk. With this amazing history and royal tradition, you could be forgiven for thinking that goldwork is only for the elite expert embroiderer. But you would be wrong! Ahead of the launch of our ‘Charles’ goldwork kit, we are running an introduction to goldwork embroidery. Louise Dawson will be teaching the secrets behind this much sought after skill. The biggest secret? It’s a really simple technique. Louise will show you how to get to grips with the core materials; Japanese, Gold Twist, Pearl Purl, Rococo and Bright Check. Some of the metal threads are purely surface stitched and others are finished at the back and so require plunging through the fabric. All easy once you know how….. This class is suitable for complete beginners or those who would like to refresh their goldwork skills. We only have a few spaces left so please get booking to avoid disappointment. Our ‘Charles’ kit was developed with the help of Helen McCook, one of our amazing visiting tutors. The design was inspired by a beautiful embroidered 18th century gentleman’s coat from our collection. Beautiful embroidered 18th century gentleman’s coat from the Wemyss Needlework School collection. Beginners goldwork morning class – Saturday 24th February 2018 book here. ‘Charles’ goldwork kit launches on Monday 26th February 2018 and can be purchased here from then onwards. There will be a discount on ‘Charles’ for those who attend our class.